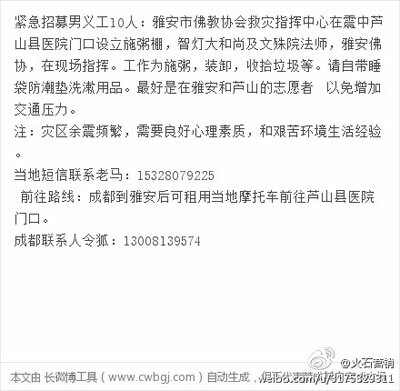 The Chengdu facebook page lists http://sichuan-quake-relief.org/ as an organisation to send your donations to. The website looks outdated, though, I’m not sure if this organization is still active? the page is outdated. they began after 08 and did a lot of work after that earthquake and for the next couple of years … i am not sure how active they were in the last year or so, but the connections and experience and trustworthiness are all still there. Peter Goff from the Bookworm started the project back in 08, if you are interested you could probably drop by the Bookworm and ask around. Other than SQR, there are two Chinese orgs One Foundation and the local Red Cross. I’ll try and get their contacts and post tomorrow. In 08 the Bookworm organized daily trips into the region to deliver water, clothes, tents and other stuff. Did you try contacting the emails on SQR, or any telephone numbers? This is 壹基金，a reliable fund for donation, you can use taobao to send money to the fund for Yaan earthquake. Sometimes I even can’t tell that it was myself shaking or the earth shaking. But compared to the one happened in 2008, it is better. The richter scale is logarithmic, so the 2008 earthquake at 8.0 had ten times the force of Saturday’s earthquake if I understand correctly. The 08 earthquake was much more powerful, and at that point earthquakes are basically unprecedented in Chengdu which made it even more terrifying. We’re lucky that nothing in Chengdu was damaged and no one was hurt. All you can take any clothes or food directly to any China post office. Also they are collecting water outside Wanda Plaza in the East.. Apparently SQR are active now again. I was amazed at how quickly some of the popular images were circulating on Saturday. I’d headed to a Starbucks at 8:30 for coffee, and by little after 9am had been sent several images repeatedly by Chinese friends over Weixin. I lost count of how many copies of the couple wrapped in a duvet I received. The fake collapsing buildings photo was also popular for a while, until most realised it was not from Saturday’s quake. Parachuting photo is funny. Good way to escape the apocalypse? Better start practicing now! Could anyone offer a hand at Lushan County Hospital? Vic, can you translate that for those who cannot read it? A list of organizations who you can support with money, goods, blood or other help. Ya’an Buddhist Association has a meal stand in front of the Lushan County Hospital, and they have worked hard in the past three days. They are in need of ten strong male volunteers to keep the stand running. However, the condition over there is harsh and you have to bring your own geers such as sleeping bags, toothbrushes, towels, and such. Ya’an local volunteers are the best fit. Chengdu volunteers will have to travel to Ya’an by train and there will be people there bring you to the disaster relief commander center, most likely by modi. Let’s do whatever we can to offer them a hand. Since Vic has posted about Yaan Buddhist Association’s work there, I wish to add that I have followed the Monk 智灯大和尚 Zhideng from Yaan temple http://www.zhideng.net and they are real good. We may also donate money/supplies to them. If anyone is interested, I can post the contacts here. Thanks. I am planning on going to Ya’an on Monday to help out. Anyone else keen on going? Would you like to travel down together? Yet to call Mr.Linggu and confirm things. Is it safe to go down there? Also what are the recommendations for donations besides money my colleagues said do not give money unless you are physically handing it over to those in need.